I wouldn’t use this lesson. I can’t explain the best-fit model adequately. I can’t adequately explain a microwave. This link was extremely helpful (thanks, Jean-Marc!) as was this explanation (thanks, Carmen!) but in my hands this problem verges on pseudocontext because I’m asking the students to use an operation (exponential modeling) that may or may not follow from the context — I don’t have a strong sense of it. But maybe you can explain the operation to your students and how it results from the context. In that case, here are all the resources and this is how I see other aspects of the lesson playing out. I need to reshoot everything, after controlling for variables mentioned by Matt and Christopher. It’ll take some time, though. Mostly because I’m sick of cheese. The original post wasn’t a lesson. I wanted to share something I found interesting and tap into our braintrust here to help me explain it. I only raise this particular caveat because there seems to be some misunderstanding that every blog post constitutes a lesson or a complete curriculum or something. Perhaps this confusion is genuine. Perhaps it’s disingenuous. Certainly it’s easier to criticize something if you measure it against a higher bar than it’s trying to clear. I’m interested in how everyone would complete this sentence: As a result of this lesson, students should understand that [blank]. 1. Play the question video. [WCYDWT] Cheese Block – Question from Dan Meyer on Vimeo. 2. Ask the students to write down a question in their research journals that interests them. Ask students to write down a guess. Then ask them to write down a time they know is too long and a time they know is too short. Put some of those guesses on the board and attach them to names. This is where you can introduce the idea of extrapolation, using what few data we know to draw conclusions about what we don’t. Open the video of the first five cubes. Ask them to write down what they think is going to happen when the microwave starts. Afterwards, ask them to write down why they think the cubes melted in the order they did. Really push hard on their idea that “bigger” blocks take longer to melt. Make sure they define bigger. More surface area? More volume? [WCYDWT] Cheese Block – Controlling for Surface Area from Dan Meyer on Vimeo. [WCYDWT] Cheese Block – Controlling for Volume from Dan Meyer on Vimeo. So we threw a sharp rock at both of those theories. Is there a better option? 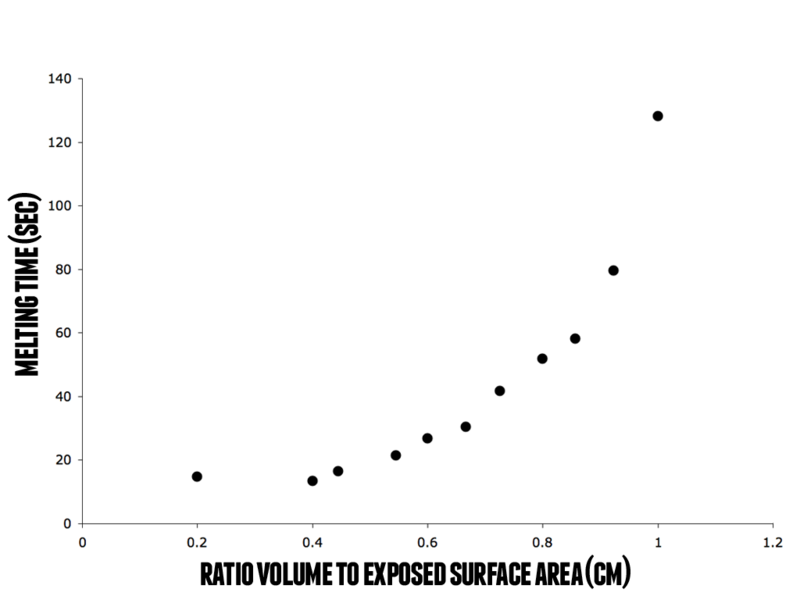 Lecture about the ratio of volume to exposed surface area or let the students discover it. Your method here matters less to me than the fact that we’ve given students some reason to care about the ratio, what it models, and what they can do with it. Using the measurement images, have the students create a table including the dimensions, the total surface area, the exposed surface area, the volume, the ratios between them, and the melting time for the block. Include the big block whose melting time we don’t know. 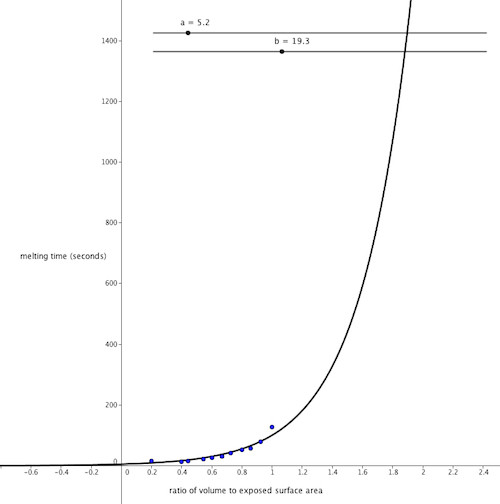 Have them graph time against one set of data. Show student work. Discuss which model looks best. 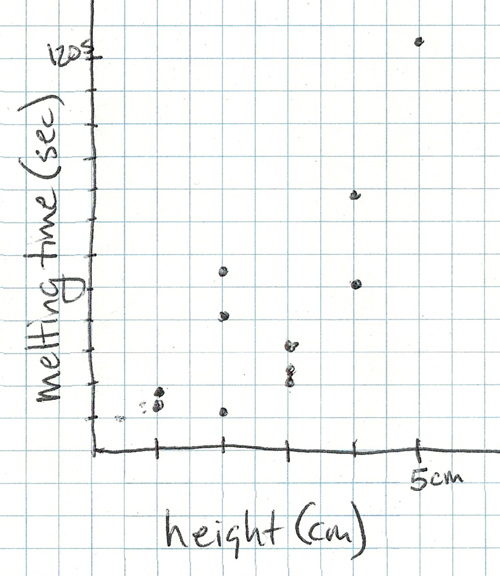 Use the Geogebra file, which graphs the melting time of the block against its ratio of volume to exposed surface area. Have them adjust the parameters until they have a good fit. Discuss the meaning of the parameters. [WCYDWT] Cheese Block – Answer from Dan Meyer on Vimeo. Compare to the original guesses. Show some love to whomever was closest. I Have The Coolest Hobbies, Ctd. Seriously you guys what’s going on here? 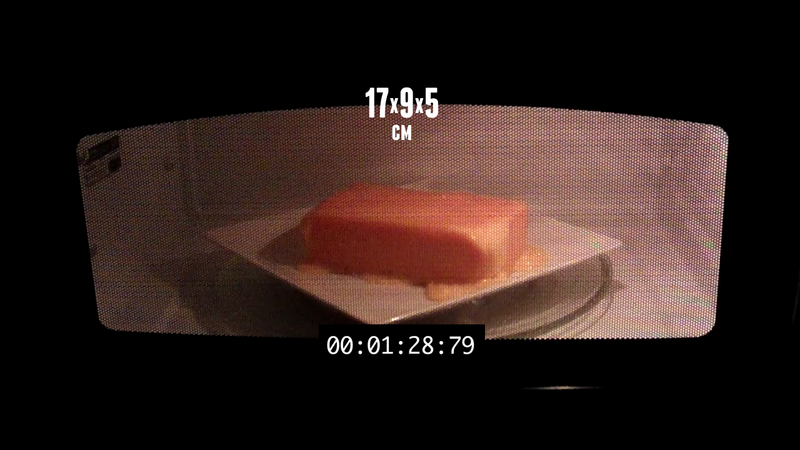 Now Liz Clark sends along a video of three cheese cubes melting in the microwave on the same plate. Spoiler: they melt in the opposite order of my video. Cheese Cubes pt. II from Dan Meyer on Vimeo. 2011 Feb 27. Liz Clark writes back in, having taken the rotating tray out of the microwave and melted one cube at a time (per Matt’s recommendations). Our results now agree. 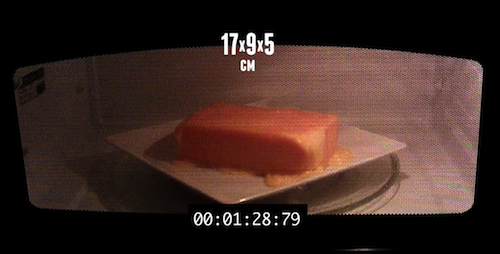 Cheese Cubes from Dan Meyer on Vimeo. For fun, I also threw in two blocks with the same surface area and two blocks with the same volume, just to test out my two prevailing hypotheses, neither of which played out. 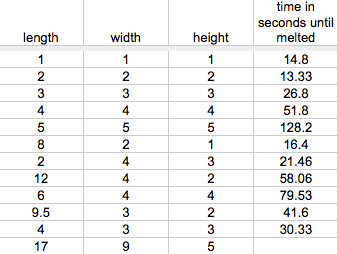 Here are the numbers in a Google spreadsheet. You could help me out by coming up with a model that fits the data well and (especially) explaining why your model makes sense in the world of microwaving cheese. I’ll post my own model as a spoiler in the comments. I have no idea why it works, though. I think we’ve all had the experience of giving so much structure and help that the problem becomes a simple routine problem when it wasn’t originally. I don’t like to think about my student teaching year but for the sake of the exercise let me describe my PACT lesson, which, if you’re in California education, you know is the summative assessment of your worth as a preservice teacher. 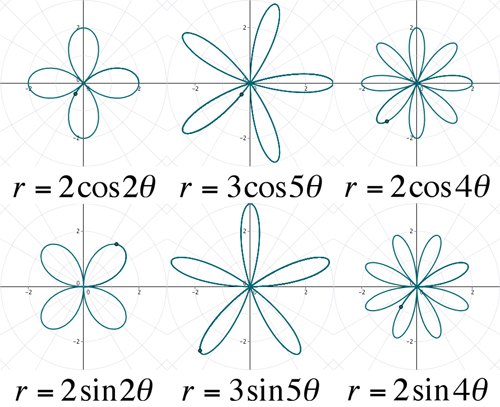 It was a precalculus class and the objective was an understanding of rose petal polar functions like r = 3cos(2theta). Students will be able graph the family. 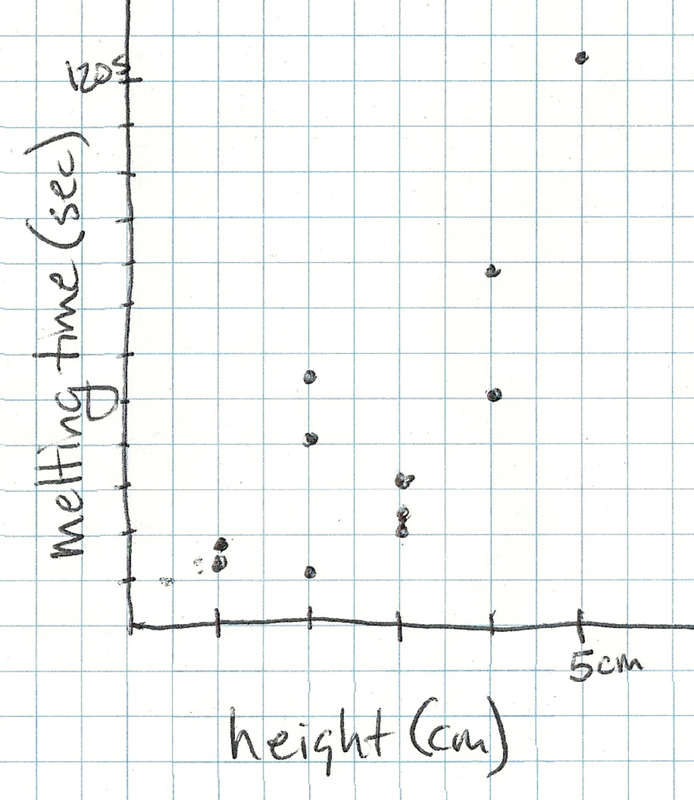 Students will be able to describe how each coefficient affects the graph. Etc. As I recall it, I was up at the front of the classroom with a TI ViewScreen showing them graph after graph, asking them to determine what the a is doing to the graph of r = asin(3theta). Then how does b affect the graph of r = 2sin(btheta)? 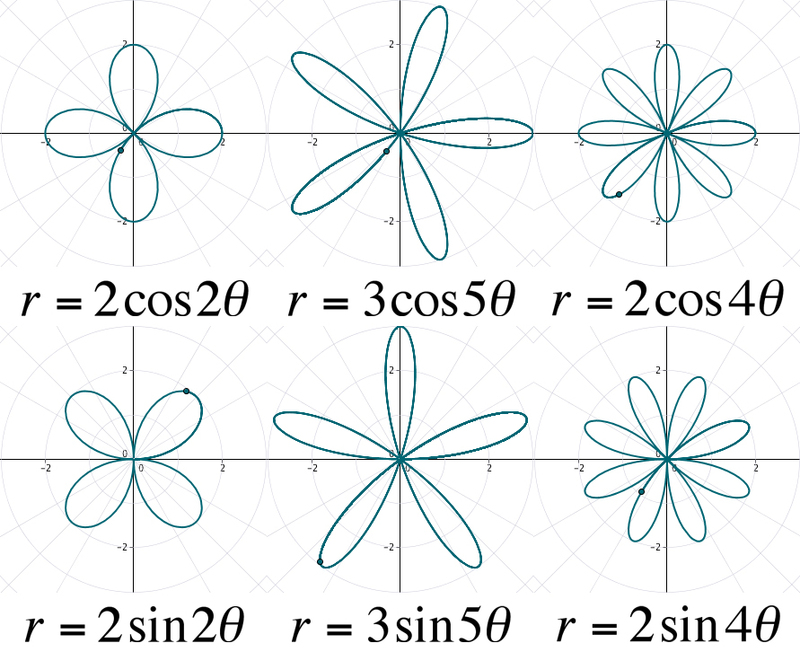 Then how do sine and cosine differ? Then I assessed their knowledge of rose petal functions with a worksheet of graphing problems. Without that understanding, if I attach so much as a negative sign to that function, my students are toast. If I change a coefficient to a fraction, they’re toast. If I change sine or cosine to tangent, they’re toast. That inflexibility is an outcome of pseudoteaching. Unless you understand what an algorithm is going to do, it isn’t going to make sense to you. The students have to develop the algorithm themselves. Given a second chance at that mess, I’d get students in groups of three or four and let each student pick a member of the family of the functions — “Okay, you do r = 1cos(2theta). I’ll do r = 2cos(2theta). 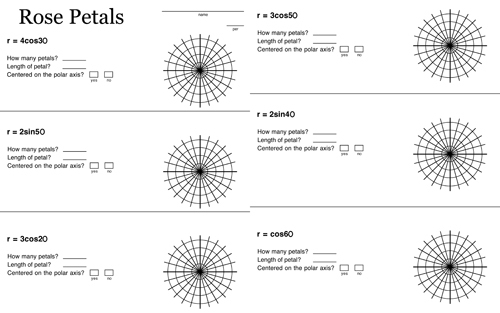 You do r = 3cos(2theta).” Rather than watch me mashing buttons at the front of the room, students would graph their functions by hand and then summarize their findings to each other and then the class. Maybe with a poster — your call. Questions from the teacher would then include everything in the breakdown above, everything I missed six years ago. Karl Fisch reminds me in the comments that I’m giving a webinar a week from tomorrow for Education Week. That’s February 24, 4:00PM EST. The cost is $49 and if it helps you complete the cost-benefit analysis, I’m estimating you’ll see 30% new material on top of my Classroom 2.0 webinar from December — at least one never-before-seen WCYDWT and a couple of exercises for teachers. For whatever else it’s worth, I’m not seeing a cent of your registration fee. If nothing else comes out of this, I hope to get a lot of smart people taking shots at my work. I’m also really grateful for the opportunity to quit fumbling around with blog posts and my mental bottle rockets for an hour, to sit down and see if I can get any of this to cohere.